Enjoy our signature service and local expertise on a great value package tour of Moscow & St. Petersburg. This classic program features remarkable downtown hotels of 4 and 5-star category, guided tours and seamless logistics from start to finish. There are guaranteed weekly departures from May through September, group size is up to 14 travelers. Welcome to the legendary capital of Russia - Moscow! Upon arrival you are transferred to your centrally located hotel and have the rest of the day free. Today you enjoy a wonderful sightseeing tour around the most magnificent Moscow attractions, including the famous Kremlin, the Red Square, and St. Basil's Cathedral. This day is dedicated to the exploration of one of the most outstanding Moscow icons - the Tretyakov Gallery and Moscow Subway. Following breakfast, you check out from your hotel and enjoy a panoramic Moscow city tour. Today you have a chance to enjoy one of the best city views at Sparrow Hills ​and see the spectacular Cathedral of Christ the Savior. After breakfast you go on a panoramic city tour around the most cherished gems of St. Petersburg. Later you enjoy a private boat ride along the rivers and canals of St. Petersburg. Following breakfast you meet your guide at the hotel lobby and go to the legendary Hermitage Museum, that houses its unique collection of world art, including the masterpieces of Leonardo da Vinci and El Greco in the halls of the Winter Palace. This is the final day of your amazing Moscow - St. Petersburg tour! After breakfast you check out from your hotel and your private driver takes you to the airport for your flight back home. 2020 Early Bird Special: Book now and secure 2019 rates! Tours start every Friday from May 15 to Septmber 11, 2020. Welcome to the legendary capital of Russia - Moscow! Your driver meets you at the airport and transfers you to your centrally located hotel for check-in. 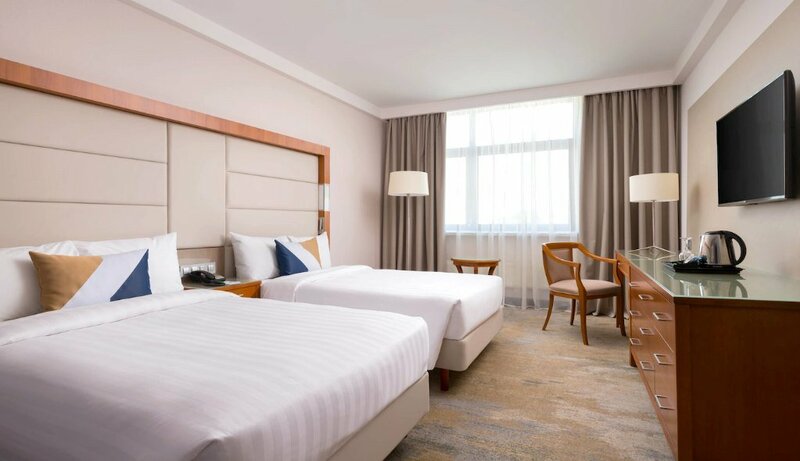 The rest of the day is free to relax in your cozy room, dine in one of the nearby restaurants or start exploring the amazing city center on your own. After breakfast, you have a welcome meeting with your guide and the rest of the group. Today you go on a wonderful 6-hour walking tour around the most magnificent Moscow landmarks. During the tour, you explore the territory of the stunning Kremlin and go inside the Kremlin walls to visit its famous Armoury Chamber that houses a unique collection of crown jewels, stunning coronation finery, hand-forged armor and weapons, royal carriages and sleighs, and world-famous Fabergé eggs. Then you proceed with the heart of Moscow, the fancy Red Square, go inside the colorful St. Basil's Cathedral and admire a beautiful facade of the gorgeous GUM department store. After the tour, you walk back to your hotel and have the rest of the day free. This day is dedicated to the exploration of one of the most outstanding Moscow icons - the Tretyakov Gallery. Shortly you arrive at the world-famous treasure trove of the Russian fine art, you have amazing time viewing the gems of its collection, including the famous masterpieces of Ivan Aivazovsky, Mikhail Vrubel, and Viktor Vasnetsov. After taking the art therapy, you explore one of the most interesting sites in Moscow hidden deep beneath the surface - the Moscow Subway. You have a quick subway ride to taste local life and enjoy the splendid decorations of its stations. After the tour, you have the rest of the day free. Following breakfast, you check out from your hotel and enjoy a panoramic Moscow city tour. Today you have a chance to enjoy one of the best city views at Sparrow Hills and see the grand building of Moscow State University, the highest of seven Stalinist skyscrapers of Moscow. Today you also see the spectacular Cathedral of Christ the Savior and learn the story of its destruction and reconstruction. After the tour, you are transferred to the train station where you board the modern high-speed Sapsan train that takes you to St. Petersburg in comfort and safety in just 4 hours. Upon arrival, your driver meets you at the train station platform and takes you to your centrally located hotel for overnight. After breakfast you meet your guide at the hotel lobby and go on an amazing panoramic city tour around the most cherished gems of St. Petersburg, including Palace Square, the St. Isaac's Cathedral, the Church of the Savior on Spilled Blood, Nevsky Prospect and many other popular attractions (no entrances included). During the tour you also visit the Peter and Paul Fortress - a burial place of almost all the Russian emperors and empresses from Peter the Great to Nicholas II and his family. Later you enjoy a private boat ride along the rivers and canals of St. Petersburg to see the city from a completely new perspective. Enchanting festival of Russian spirit "Feel yourself Russian" is performed by a professional folk ensemble at the Nikolaevsky Palace. Three musicians brilliantly perform folk compositions. Following breakfast you meet your guide at the hotel lobby and go to the legendary Hermitage Museum, that houses its unique collection of world art, including the masterpieces of Leonardo da Vinci, Rembrandt, El Greco, Francisco Goya and Thomas Gainsborough in the halls of the Winter Palace as well as the works of the renowned impressionists in the General Staff Building. They say that if you were to spend three minutes by each of the exhibits in the Hermitage, it would have taken you three years to see the entire exhibition. But don't worry - you have an experienced guide, who will show you the best rooms and halls of the exhibit within several hours. This is the final day of your amazing Moscow - St. Petersburg tour! After breakfast you check out from your hotel and your private driver takes you to the airport for your flight back home. We hope you've enjoyed both magnificent Russian capitals and return home with lifelong memories and unforgettable impressions. We wish you a safe flight and hope to work on your future trips! 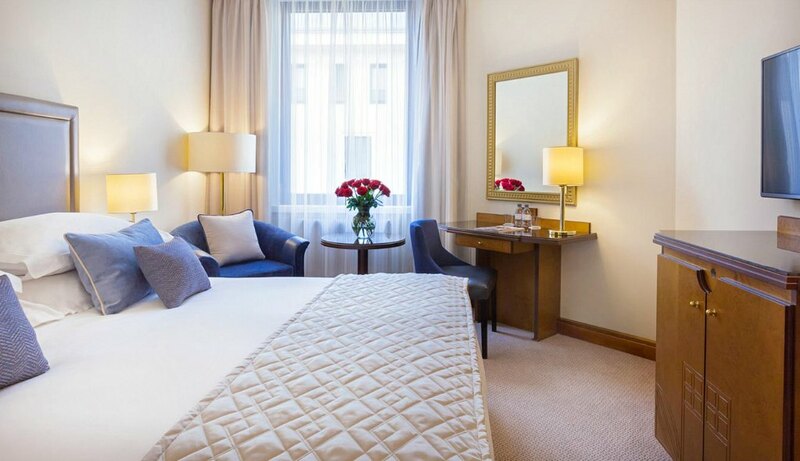 Located on a picturesque 18th-century street not far from the Moscow Kremlin and Red Square, this remarkable 4-star hotel offers a great combination of charm and quality. 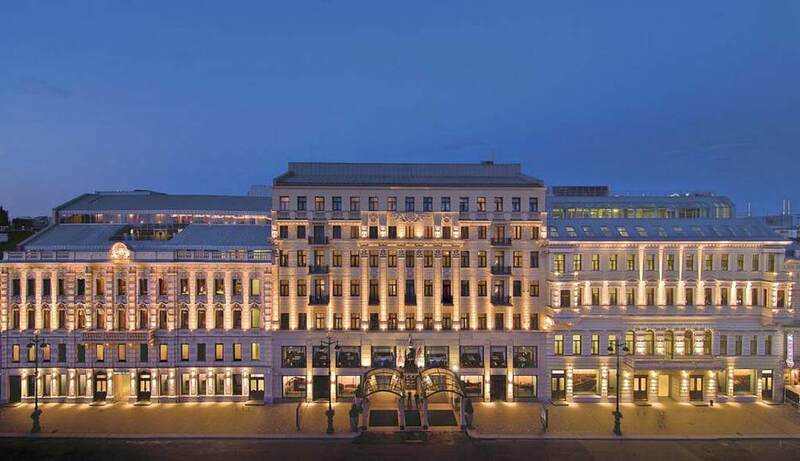 The luxury hotel Corinthia is located on Nevsky Prospect, in the very heart of St. Petersburg and offers elegant design coupled with high-quality service. Moscow is unlike any other city on Earth, it is diverse and vibrant, an adventure waiting to happen! Being the most recognizable symbol of Russia in the world, Red Square is an absolute must see when in Moscow. St. Basil’s Cathedral is Moscow’s most famous artistic work of architecture set in the romantic Red Square. 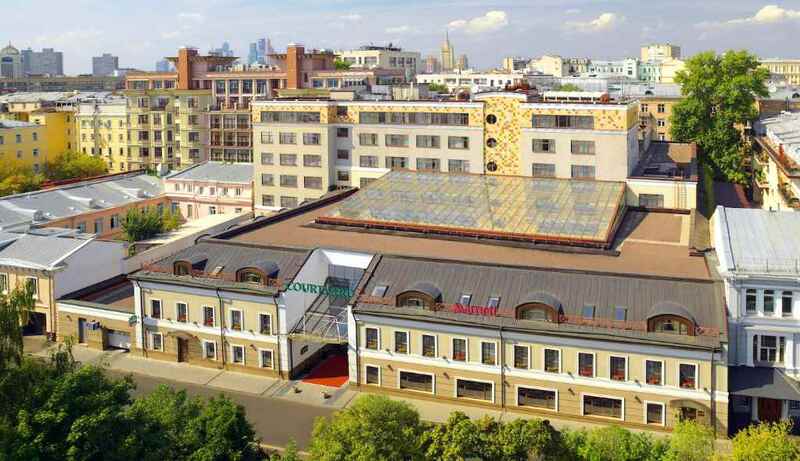 The famous GUM is a large department store in the Kitai-gorod part of Moscow facing Red Square. See the 344-feet Cathedral of Christ the Savior - the tallest Orthodox church in the world. One of the highest points in Moscow and one of its most breathtaking places - the Sparrow Hills. The symbol of Moscow and entire Russia, the Kremlin is often described as the 8th Wonder of the World. History and luxury is revealed inside the Kremlin as the Armoury Chamber displays treasures like Faberge Eggs. Over 1000 years of Russia's finest art from Rublev to Shishkin, over 170 000 exhibits of religious and modern art. Moscow Metro is like a whole underground city that holds the world's largest collection of Stalinist Art. Often called "The Venice of the North", St. Petersburg is the crown jewel of world capitals and a city of canals and palaces. The most iconic golden dome of Russia and a landmark of over 150 years of St. Petersburg history. The Savior on Spilled Blood stands out in the St. Petersburg skyline with its 5 unique colorful onion-domes. The Peter and Paul Fortress and its bell-tower symbolize the might and power of Russia. The world-famous Hermitage Museum is the home to the largest collection of paintings in the world. I cannot begin to applaud your tour of the TWO CAPITALS in Russia! I get quite emotional when thinking about it still! I'd say to anyone who wants to travel to Russia - you must do Travel all Russia!! You can also call our office phone number +1 (800) 884-1721 and talk to your favourite travel specialist.